Between celebrating mothers and chasing migrants, most of you probably enjoyed a busy and fulfilling weekend. We can’t wait to hear about it! Corey was hoping that Gray Kingbird–in New York State–would be his Best Bird of the Weekend but sometimes long-distance twitches result in dips. 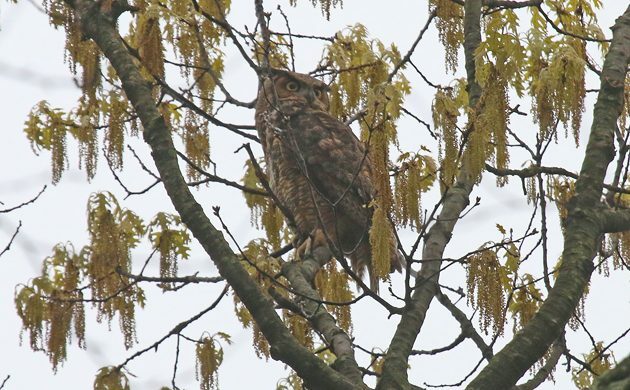 Instead, he was pleased to see unexpected Great Horned Owls on both Saturday and Sunday, the latter being pursued by a raucous mob of Blue Jays. Seeing an apex predator is always a thrill so despite missing the kingbird Corey is still happy with Great Horned Owl as his Best Bird of the Weekend. Since I met Corey on his ill-fated attempt at the improbable kingbird, the GHOW made my shortlist for BBOTW as well. However, in the midst of migration, I’ve been most enamored with the White-crowned Sparrows that have haunted my feeders for the last few days. Once the White-throated Sparrows arrived, I expected a glimpse of white-crowns passing through; what I’ve gotten instead are long, lingering looks for nearly a week. The best of the weekend had to be the male Rose Breasted Grosbeak happily singing in my yard on Saturday. No major birding for me this weekend, my best/favorite was White-tailed Kite hunting near the house. I heard my first Morepork – or Southern Boobook, of the year. The Rufous and Anna’s Hummingbirds at our feeder. We’re trying to determine how many there are and the politics among them, wondering if we should get a second feeder. Of a total 35 species found during my stint as part of the Wissahickon Valley Watershed Association’s birdathon (not bad for a soggy morning), I got to hear both Louisiana and Northern Waterthrushes, along an unusually rushing Wissahickon Creek. Three cheers for Margaret from Wissahickon Birds and Brews for organizing the team and for her ace ear! For me, chasing a ruff that was found in Hancock County, Indiana, which was only a half hour from my house (https://download.ams.birds.cornell.edu/api/v1/asset/28391591/medium). Nemesis no more!